I have grave concerns about media reports on the possibility of early prison releases and reducing criminal charges to save money. Our economy and jobless rate are resulting in increased crime and some questionable proposed budgetary fixes by both State and local governments. In a recent Mercury News editorial by District Attorney Dolores Carr and Dennis Graham, they express serious concerns about a proposal to reduce criminal charges from misdemeanors to felonies so that criminals can be sent to county jails instead of state prisons, thus saving the state millions of dollars. The results of this proposal would have devastating affects not only on public safety but on our already understaffed public safety and enforcement departments. The San Jose Police Department currently has 1,352 officers to serve over a million citizens. In the year 2010, an estimated 40-50 officers will be retiring, taking with them approximately 2,000 combined years of experience, and will reduce our Police Department to a grim 1,312-1,302 officers. With budget constraints at the state level, a proposed raiding of city funds, and a seeming lack of willingness on the part of our City Council to hire the amount of officers we truly need to serve our community, I fear the situation is only going to go from bad to worse. With the early release of prisoners and reduced criminal charges, we will be creating a monster of enormous proportions. Not only will the safety of our neighborhoods and police officers be jeopardized, but we also will be forced to contend with more highly-sophisticated criminals who will be using more efficient technologies to commit crimes in our community. Getting a job once you’re a felon is difficult, and this tends to lead them back to the profession they know best: crime, and the victimization of others. Our parole, and probation departments are already understaffed, over-worked, and carrying huge caseloads. If these proposals go forth, keeping track of perpetrators will be nearly impossible. Our judges and courts will be even more overloaded with cases, and justice for victims will fall by the way side even more drastically than it does now. According to Amy Cornell, Public Information Officer for the Santa Clara County District Attorney's Office, “With the poor economy already resulting in cutbacks in positions, the number of cases we see come through our office could increase at an overwhelming rate. Prisoners who are considered ‘low risk’ will be the ones released, but with the reduction and elimination of parole supervision, we could be seeing a massive spike in re-offenses. In essence, we are minimizing the severity of certain crimes by allowing criminals to go free. Criminals are being allowed to escape accountability and proper punishment for their crimes. This is a disservice to our community, and a serious threat to public safety. If that isn’t enough to concern us all, a recent article by April Dembosky in the Mercury News discusses the seriousness of communicable diseases that will be brought into our communities by prisoners released into our communities. Health care provided in prisons is insufficient; so many prisoners will carry HIV, Hepatitis C, and Tuberculosis into our communities. With people going without health care, and many struggling to get or keep health care for themselves and their children, the added possibility of being exposed to highly contagious diseases being brought into our communities by criminals just to cut state costs is very alarming to me. In writing this article, I urge readers to call or write the Governor, members of the State Legislature, the Mayor and City Council, even Senators and Congressmembers, asking them not to allow this travesty of justice. Thank you! Do you know what your taxes are being spent on and what city services or public benefits San Jose residents and businesses receive from them? As we have discussed in “Just the Taxes Ma’am”, San Jose receives General Fund revenue of $663 per resident which is better than the average among 15 cities in Santa Clara County (5th) and the 12 largest cities in California (5th as well). Yet we continue to under-staff and under-fund essential city services including police, fire, and emergency medical services. Budget documents prepared by San Jose city staff omit important revenue, staffing, and expenditure details. We frequently hear about city government spending in newspaper, television, or radio news, mostly as a result of a controversy, non-profit emergency funding, or critical City Auditor reports and Civil Grand Jury reports. Most residents and businesses have little idea what their taxes are being spent on. But it’s not for lack of curiosity. The lack of readily available and detailed city service spending and tax subsidy reporting makes it difficult for residents — not to mention the City Council — to understand where our taxes are being spent. This is particularly true for: 1) spending for services from non-profit, community-based organizations, school districts, or another government organization, or 2) corporations, developers and property owners receiving grants, economic development incentives or tax subsidies. Here is a list of organizations receiving over $200,000 from the City of San Jose to provide a service in Fiscal Years 2005-2006 and 2006-2007. This is an incomplete list. We do not know how much support they received above $200,000, and we don’t know what specific service or services some of them provided as a public benefit to San Jose. Here are two lists of organizations receiving grants from the City of San Jose in Fiscal Year 2007-2008, the first sorted alphabetically and the second by city service area and core services. 1. Who is receiving these services? 2. How should we classify these services? Do we know the answers? If not, why doesn’t the city administration make this information easily available and obtainable? How can the Council and public make good policy, budget priorities, and spending decisions if we do not know where are our taxes are being spent, what tax subsidies are being provided and to whom, what services we receive, who is being provided outside services and what is the public benefit for our taxes spent? Although the emphasis of this blog is directed at public safety from a police perspective, we would be remiss if we did not give an occasional nod to the other half of public safety — firefighters. PBS recently re-aired a documentary on Santa Rosa firefighters. It was produced in 2002, but is still relevant today as I try to get my mind around the recent, continued, and concerted attacks on San Jose public safety personnel by the local newspaper, radio, and most disconcerting, my own employer. Those who would try to capitalize on the current financial crunch by advocating a stripping away of many negotiated gains over the last twenty years seem to be under the impression that ours is a normal profession. It is not. Watch the attached portion from the documentary and you will easily see that police and fire fighters do a job no one else wants to do, or in most cases, is qualified to do. Whether or not they would admit it, I would argue that those whom you see in the video will carry an emotional toll from their job well into their retirement. Public safety work is rewarding, but at the same time, the price one pays both physically and emotionally cannot be easily conveyed. To San Jose firefighters: all indications are that the city, your employer, is going to try to undo twenty years of improved working conditions for your members. You have a fight on your hands. Please know that the members of the SJPOA, who know firsthand the work you do and the risks you take, stand with you. All professional rivalry aside, know that when one of our members is shot, stabbed, or seriously injured performing their job, we’re relieved and deeply appreciative when you arrive on scene. I just wish your employer valued you as much as we do. Sgt. Jim Unland is a 21-year veteran of the SJPD and a member of the Board of Directors of the San Jose Police Officers’ Association. The San Jose Police Officers’ Association would like to thank 17-year-old Chris Coutinho and the other members of Boy Scout Troop 294 (South San Jose) for the work they did renovating the area around the sign at Jeffrey Fontana Park. This park was dedicated to the memory of San Jose Police Officer Jeffrey Fontana who was killed in the line of duty on October 28, 2001. Over the course of several days, the scouts re-routed irrigation and laid new concrete in front of the sign to improve the curb appeal. Chris conceived this project as part of the process to earn the rank of Eagle Scout. He raised funds through donations from his Charter, San Jose Councilwoman Nancy Pyle, and the SJPOA. Unfortunately, no good deed goes unpunished. On one of their workdays, someone stole a Hilti brand power hammer and drill bits from the job site. This piece of equipment had been loaned to the Troop, and the replacement cost was in the thousands of dollars. No one’s insurance covered the loss. When we learned of the theft, the SJPOA established a victim’s assistance fund and, helped by stories in the local paper by Lisa M. Krieger, we received $1,800 in donations from concerned citizens. Hilti representatives Marcus Oden and Brian Comeau also stepped up to the plate. They heard about the theft and donated a replacement power hammer and several of the drill bits. They were also able to replace the remaining stolen items at a reduced cost. With the money left over from donations, the SJPOA plans to fund other community projects performed by Troop 294, including continued maintenance and beautification at Jeffrey Fontana Park. Protecting San Jose has been a calling for my fellow officers and I. We all strive to make our city a better place for all our families. Protect San Jose’s Beat Cop has been asking citizens to pitch in and work with the police department to help make our streets safer. I think we need to ask a few other groups to join us and help protect San Jose. This last weekend, in the McEnery Convention Center's parking lot, San Jose had it’s 20th homicide of the year. The violence following the Dub auto show and concert was somewhat predictable. Event performer and notorious rapper E-40 has a following that tends to bring his lyrics to life. Not so long ago, E-40 had his own nightclub on South 2nd Street in Downtown San Jose, the Ambassador’s Lounge. Nightly brawls at the club brought some attention to the problems with Downtown’s image and night life. The final straw came in the form of a running gun battle following an E-40 performance that was like something out of an action movie. Countless bullets flew across streets and parking lots leaving three shot, and police action closed the club. Will history repeat itself? San Jose has a new big box club called Wet, just a few steps away from the old Ambassador’s Lounge. We certainly see nightly brawls outside of this club, and a recent stabbing inside the club caused a temporary suspension of its entertainment permit and brought some press attention to the issue. The larger issue is changing the image of Downtown San Jose and making it a safer place. Police can only respond to violence after if occurs. There are, however, groups who can help protect us before the violence happens. Downtown events in our parks, convention center, and other public facilities are managed by contracted organizations like Team San Jose and the Downtown Association. These tax-funded groups make the choices of who will entertain us in our Downtown. These choices affect the safety and image of our Downtown. We have responsible and profitable choices available to us. Attracting wildly successful hip-hop artists like Roots, whose lyrics don’t inspire hate, fear and violence would be a good first step. Not extending alcohol sales hours at park events is another. Think of the byproducts of a poorly planned event: the police overtime needed to investigate a homicide or shooting — or stabbing — in a concert setting among thousands of people; the citizens in our other neighborhoods, left with only a handful of officers to ensure the safety of hundreds of thousands of people when the majority of resources are pulled Downtown for another major crime response; the officers’ safety when they have to respond to violent crimes in those neighborhoods with no back-up available. The quick dollar made by booking fare whose image and message puts fear in our citizens is not enough to cover the cost of policing the incidents that erupt at nightclubs and bars afterwards. The Civic Auditorium on San Carlos Street has a beautiful new facelift and is now attracting new artists. Will some acts be reluctant to come into a downtown known for post-show gun battles? I think they might. Downtown San Jose is a community and a place to bring our families for entertainment and culture. There is however, tremendous pressure to make Downtown profitable. New, towering, luxury condominiums are flying up all over, and hundreds of millions of redevelopment tax dollars are being invested there. Risks are being taken by both private and public entities. In order for our Downtown to succeed, a clear direction must be set by its operators. The citizens of San Jose must tell our city leaders to make Downtown safety a priority. The City’s Redevelopment Agency and other policy agencies must make Downtown safety a priority in their planning. And groups like Team San Jose — who answer to the City — must hear this message loud and clear: protecting Downtown San Jose takes a cooperative effort by all involved. With a clear direction and a positive image of Downtown, the people will come and the profits will follow. James Gonzales is a San Jose Police Officer. Since the late 1980's, the District Attorney has dedicated a team of professionals to locate and recover children who have been abducted by a parent or family member. This is a complicated area of the law as the district attorney may utilize either criminal or civil laws in family abduction cases. While I cannot comment specifically on the case presented by Kathleen Flynn in last Wednesday’s blog on this site, I can give some general information about family abduction matters that might be helpful. In California, a person may not withhold, conceal or abduct a child from another person who has a right of custody to the child. This is different than most states as California does not require that a custody order be violated. In California, both parents have an equal right of custody to the child, even without a court order. California has been used as a model for other states in this regard. The national Uniform Child Custody and Jurisdiction Enforcement Act (UCCJEA), which has been adopted in 48 of 50 states, is based upon the California Civil Code sections that mandate that prosecutors locate and recover children taken in violation of a person's right to custody. What is so helpful about these civil code sections is that they provide the district attorney with additional tools other than prosecution in order to locate and recover children. This is important because an arrest warrant may be served upon an abductor, but it will not get the child back to the left-behind parent or guardian. Alternatively, under the civil enforcement option, the prosecutor may get a protective custody warrant for the child and recover the child. Both parents or guardians then return to family court where the judge may resolve outstanding custody and visitation issues. Another great tool provided to prosecutors is that we may facilitate communication between judges. For example, if one court issues an order regarding custody and a parent removes the child to another jurisdiction and gets another order without revealing that there was a prior order, there would be two conflicting orders. A judicial communication (a fancy term for getting the judges to talk on the record, in their respective courtrooms, with the parties present in their jurisdictions and the matter being conducted on speakerphone and taken down on the record) enables the judges to examine the case history and documents and make a determination as to which court order takes precedence. I want to take this opportunity to remind you that there is no waiting period to report a missing child, despite what you may hear on television (Penal Code 14205). In fact, we ask that police take a missing person's report and enter the information into the Missing and Unidentified Person System (MUPS) any time a parent or guardian reports to the police that he or she does not know where the other parent and child are. This is because, even if the parent is with the other child and the parent takes the child from the other parent and withholds the child, if the other parent does not know where they are located, the child is considered "missing." If a situation arises such as the case Kathleen describes in her blog, please contact the district attorney's office in the county where the left-behind parent lives. There are 58 counties in our fine state, and most DA offices have individuals trained to handle these cases. Our District Attorney, Dolores Carr, created a special service for Santa Clara County residents who wish to report a visitation violation. Her office website now allows a parent to make a visitation violation report online without having to contact their local police agency. This not only frees up valuable police resources and time but also saves the reporting party from having to go to the police station to collect a copy of the report as the party can print the report out immediately at home. Please be advised that, upon receipt of the online visitation report, the District Attorney's Office will not take further action on the reported violation, but the reporting party may use this report in any future family court filing. If you have any questions, you may contact me directly at (408) 792-2523 or jsylva@da.sccgov.org. If you’d like our assistance on an abduction case, I ask that you please call our intake number at (408) 792-2921 during business hours. Julianne Sylva is a Deputy District Attorney for Santa Clara County assigned to the DA’s Child Abduction Unit. She wrote this article in response to last week’s blog by Kathleen Flynn and the comments it generated. When I say, “vegetable peeler,” what do you see in your mind’s eye? I’ll wait a moment while you get the image. OK, do you see what I see — a curved kitchen implement a few inches in length used for peeling carrots and potatoes? How about if I were to ask you what you picture when I say, “machete,” “sword,” or “dagger”? Each of these words has a distinct connotation and brings to mind a different image. When the average person communicates, he or she attempts to use precisely the words needed to convey a particular (and accurate) meaning to the intended recipient. Apparently, our local newspaper writers are more interested in conveying scandal than accurate meaning. Several years ago when a San Jose police officer was confronted by a volatile woman holding a “bladed weapon,” he ordered her to put it down. When she refused, advanced on him and raised it over her head, the officer, fearing for his life, fired his pistol at her to protect the lives of those around him as well as himself. 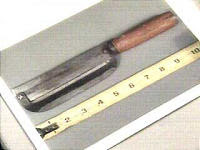 This “bladed weapon” was approximately 10 inches in length and resembled a meat cleaver. Reporters for the local newspaper continue to refer to this bladed weapon as a “vegetable peeler,” which the officer “mistook” as a cleaver. In fact, they did it again in Sunday’s edition, six years after the incident occurred. In reality, what they call a “vegetable peeler” is a cleaver-like implement with a peeler apparatus built into the blade area. To clear up any confusion, I’m including a picture of it here. There is a very simple point on this matter which I believe has been overlooked all these years: it doesn’t matter what we call this thing. When Bich Cau Thi Tran made the fatal decision to ignore the officer’s demands, when she decided to advance on the officer with the item in question raised above her head in a menacing and threatening manner, it was no longer a kitchen utensil of any kind — it was an instrument of death. It became the sort of deadly weapon that could prevent that officer from ever seeing his loved ones again. I was the supervisor on the scene that night. I realize I’m probably not the most objective person when it comes to this issue. But let me tell you something: to do our jobs effectively, we rely on people obeying lawful orders. If they don’t, people can die, and no one wants that outcome. If a police officer is confronted by a person holding a bladed tool and orders that person to drop it, they should drop it. That’s what any law-abiding citizen would do because they understand the consequences at stake. Here’s a question that no one has ever bothered to ask: Why did Tran ignore the officer’s commands and go to a drawer in her kitchen to grab this bladed instrument when the police came to her house on a child endangerment call for service? Why this particular device? What was her intent? What sort of message could she have been trying to convey to the officers? I don’t know about you, but “compliance” and “cooperation” certainly aren’t what I’m thinking. There is no other logical conclusion that can be drawn other than her obvious intent to cause or threaten to cause physical harm to the responding officers. I’m not sure why reporters for the local paper want their readers to have an image of a harmless kitchen utensil when it comes to this tragic event. Instead of the phrasing “an Asian vegetable peeler that the officer mistook as a cleaver” how about, “an Asian vegetable peeler that looks like a double bladed meat cleaver?” If I were cynical, I might think they were trying to disparage the police department or worse, suggest the most vile use of unnecessary force. I’m not saying that San Jose police officers are perfect and never make mistakes. But I know this for a fact: not one of the men and women I’ve worked with for the past 21 years desires to take a human life. We got into this profession to protect life. And for the local paper to suggest, imply, or infer otherwise is the only miscarriage of justice to have occurred in this whole tragic episode.